I’ve noticed something about my husband’s wardrobe and it has a lot to do with who he sees each day and where we live. 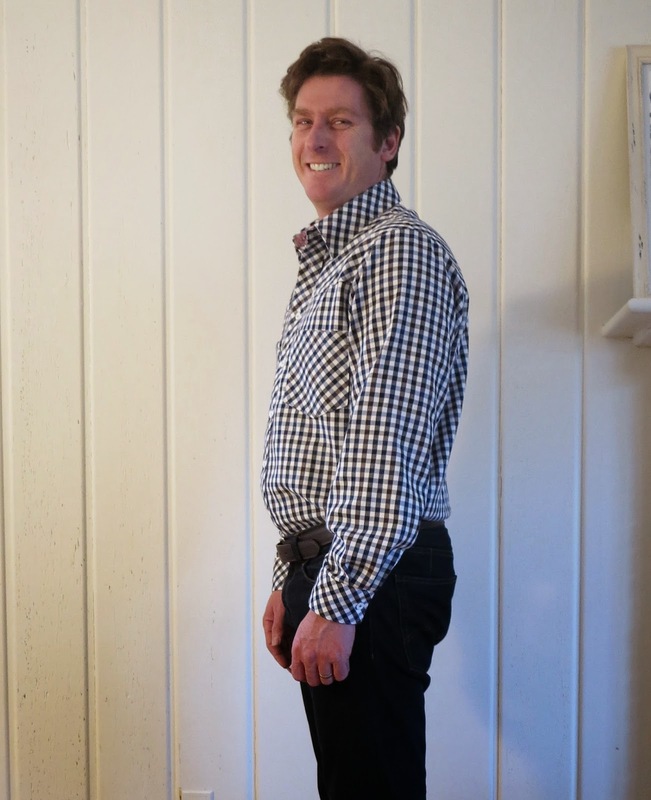 When he first started working with veterinarians and farmers in Australia, I noticed plaid shirts creep into his wardrobe for the first time ever. 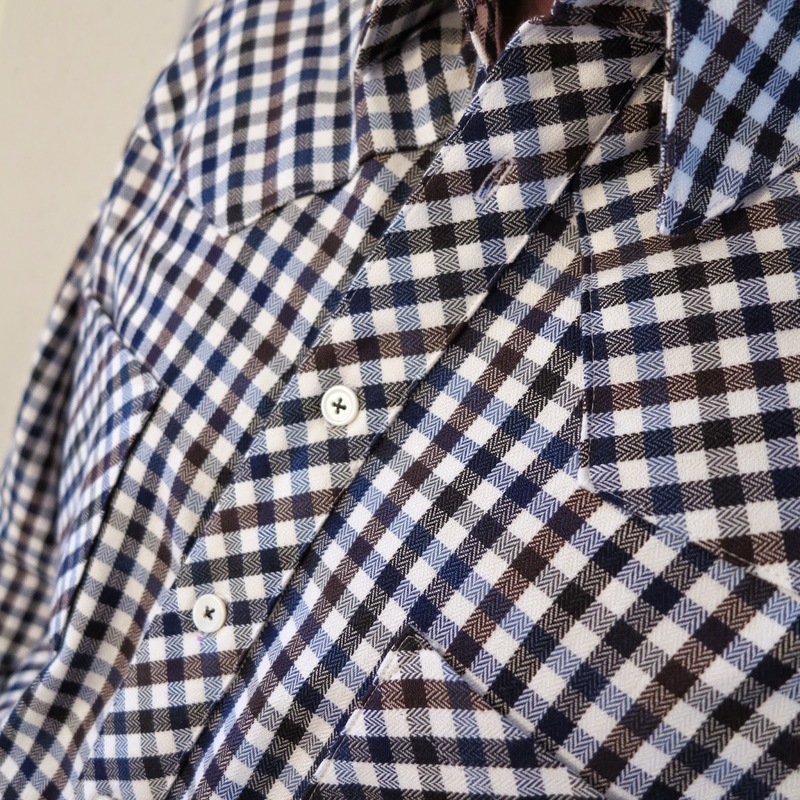 Rodd and Gunn took over from Hugo Boss and Ermenegildo Zegna as his brand of choice. So it stands to reason that there would also be some wardrobe updates after moving to the Midwest. It began with cowboy boots. 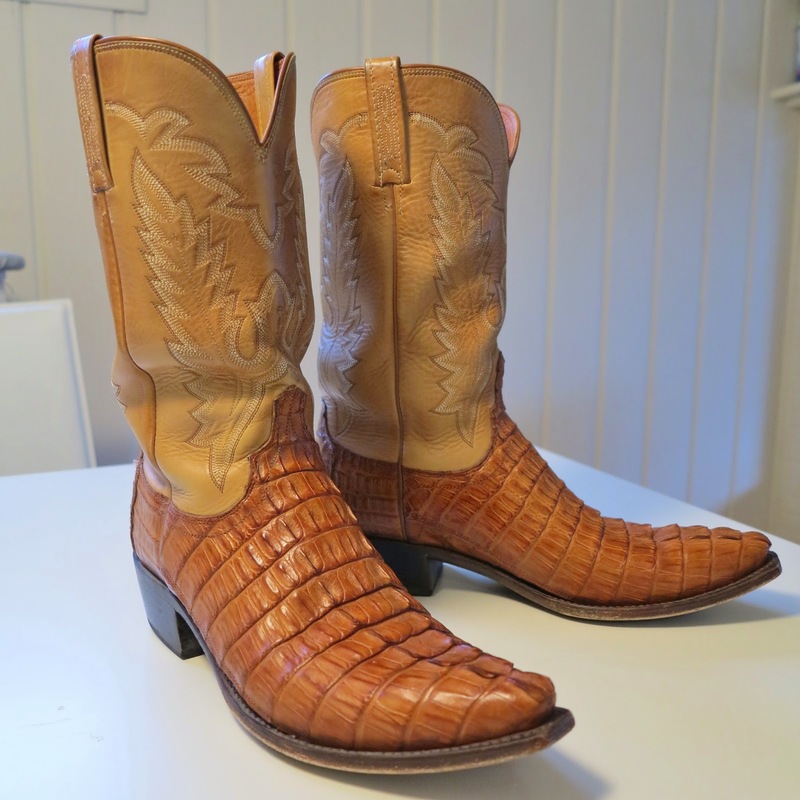 Not just ordinary cowboy boots. They had to be the real deal, genuine caiman. They go surprisingly well with the Drizabone he’s been wearing for the past 18mths. So why would I be surprised that he would put in an order in for a “western-style” plaid shirt. He was quite specific on this one. Plaid was not enough. It needed to have the Western yokes and pockets too. *Sigh*. I’m really not into sewing costumes or matching plaid. 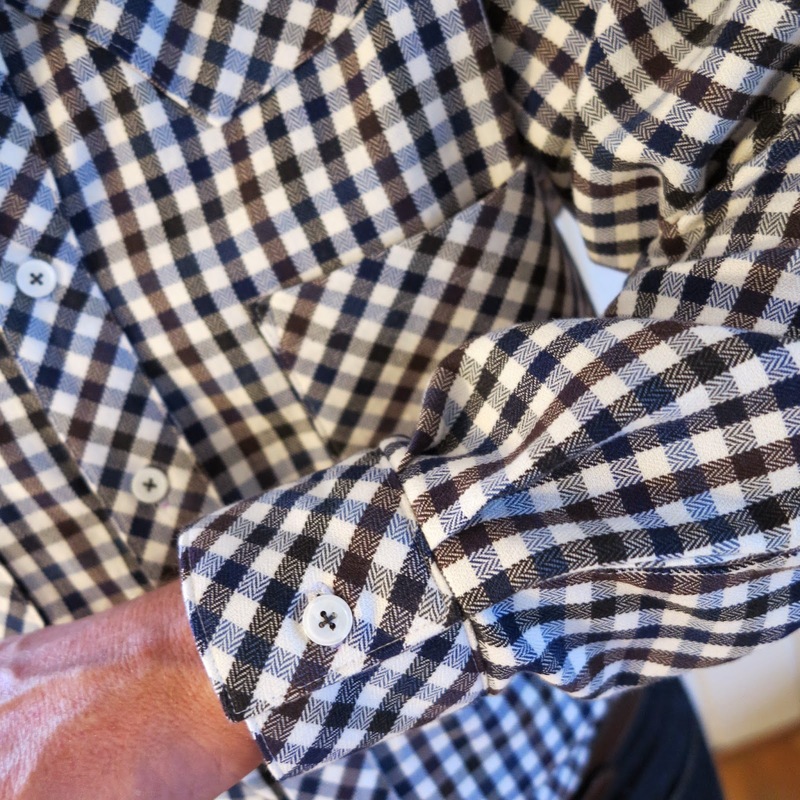 I wasn’t planning on rushing into this make, but I somehow managed to stumble across the most amazing brushed cotton, Italian shirting during a recent trip away, when I was lucky enough to visit Britex Fabrics in San Fransisco, in person. The fabric is beautifully smooth on one side and brushed soft on the underside. I wasn’t very excited about sewing a “Western” shirt until I found this fabric. Fabric makes all the difference. The pattern I used was Simplicity 1327. 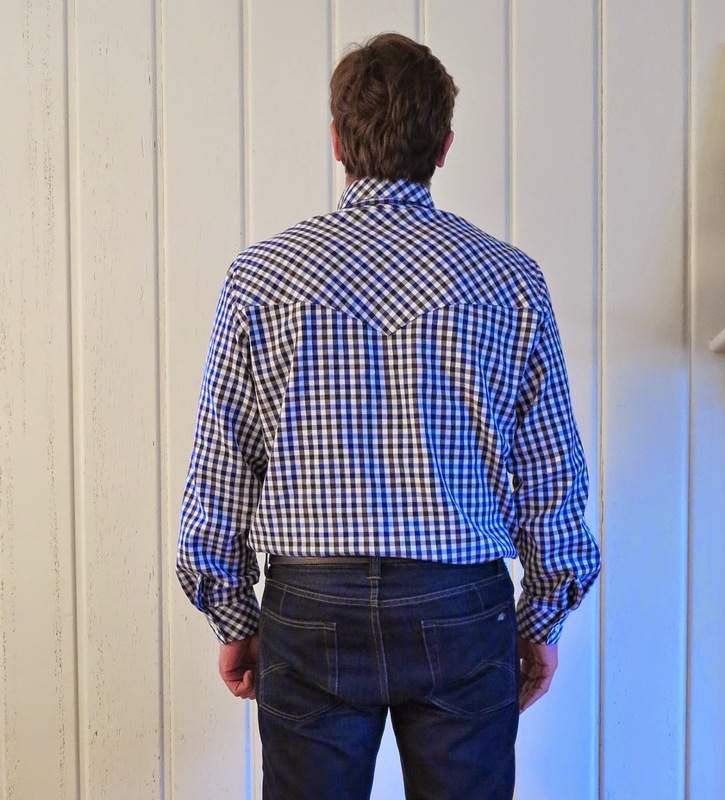 The sizing on this pattern is more general than other shirt patterns, which makes for less precise sizing. 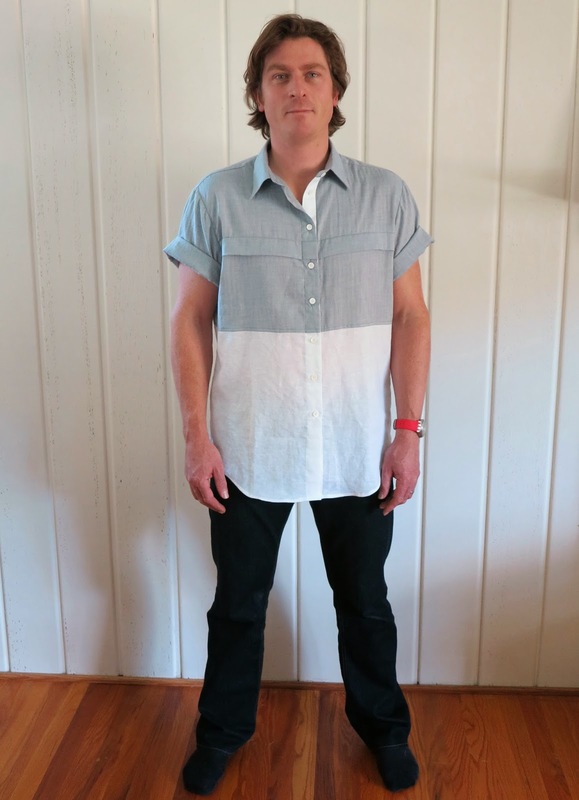 I cut this shirt in a size L, which was specified for a 42-44″ chest. My husband is a 42″ (or possibly a smidgen more after Christmas) which made me wary of ending up with an unattractively oversized shirt. To accomodate my laziness in lack of muslin making, I made the shirt up according to the instructions but only basted the side seams together initially. This enabled me to check the fit around the torso. 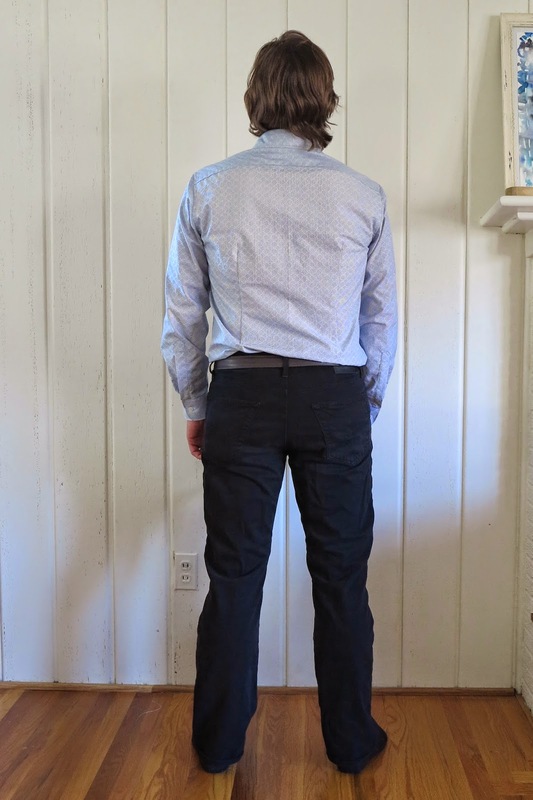 It was a little roomy to begin with so I graded the seam allowance from 5/8″ at the cuff (which was already a good fit) to 1″ at the shirt hem. This brought the side and underarm seams in by just the right amount. All the yokes, placket, cuffs, and pockets were cut on the bias. Apart from the yokes, which were stitched on the shirt as overlays, I fused interfacing to all of the other bias cut pieces to avoid them stretching out of shape while I worked with them. I used very light interfacing for the pockets and prepared them in the same way as this tutorial. 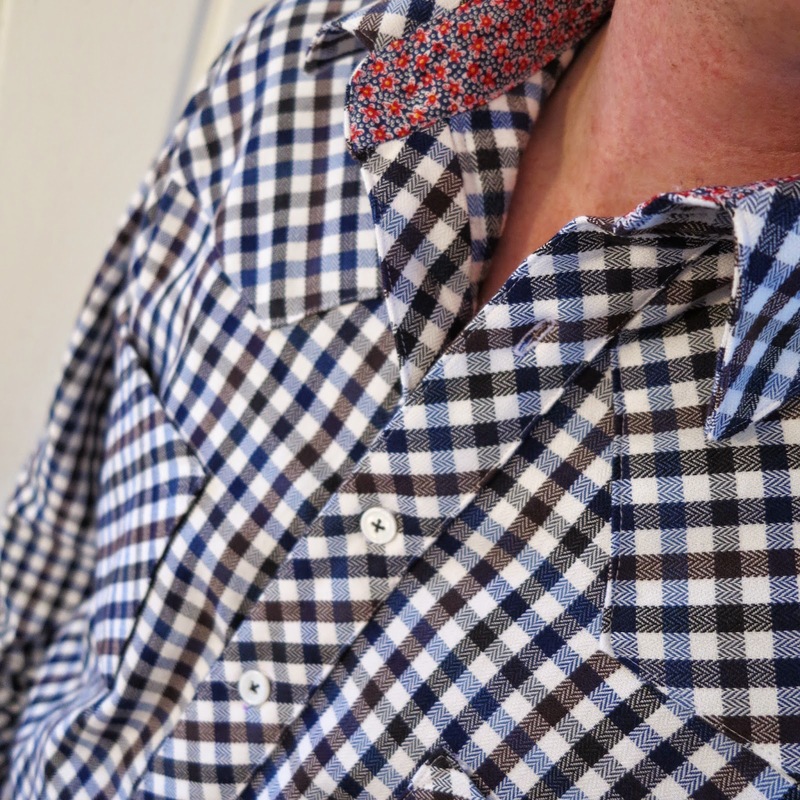 I also used a little bit of Liberty of London as contrast in the collar band. And I came so close to matching up those bias stripes on the cuffs. Despite my extreme lack of excitement in this project, I quite like the outcome. The bias cut plaid made for lovely contrast details in the shirt and I’m pleased with how the sizing worked out in the end. But more importantly, the shirt looks great with those cowboy boots! 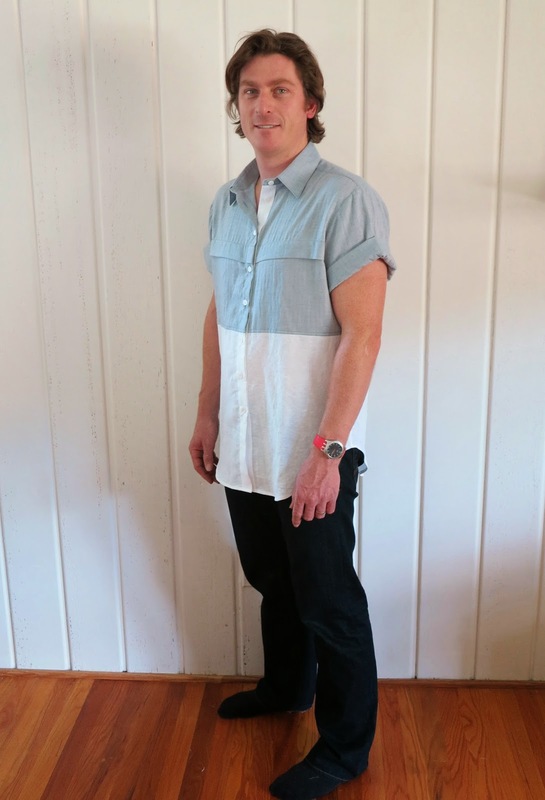 This entry was posted in Britex, cotton, men's shirt, shirt, shirting, Simplicity 1327 on January 26, 2015 by Debbie Iles. So, this shirt is another version of the oversized white man-shirt I made last year. 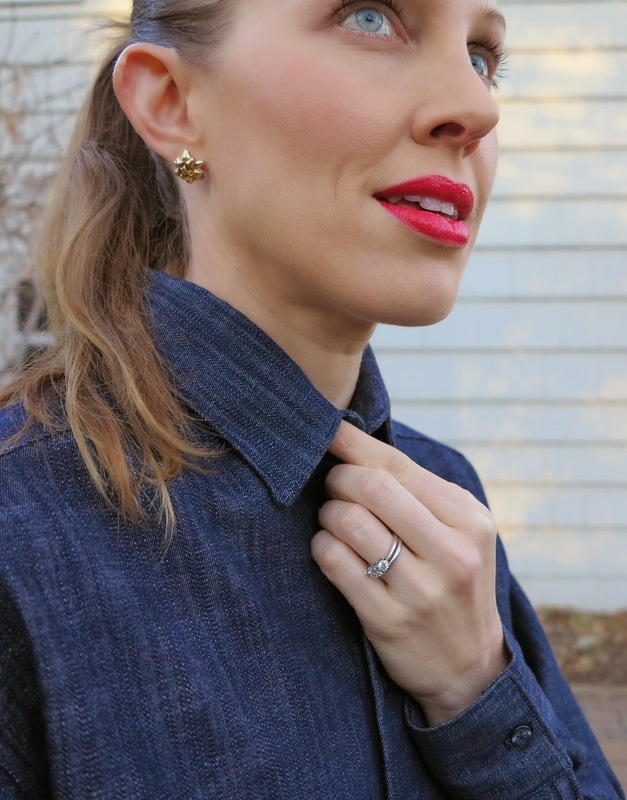 I made it in an attempt to replace my beloved Anna Sui Chambray shirt, that has now been retired, but it opened my eyes to the fact that chambray and denim literally goes with everything. I’ve been loving the look of oversized, drop shoulder shirts this season. I’ve also been craving the look of denim on denim. 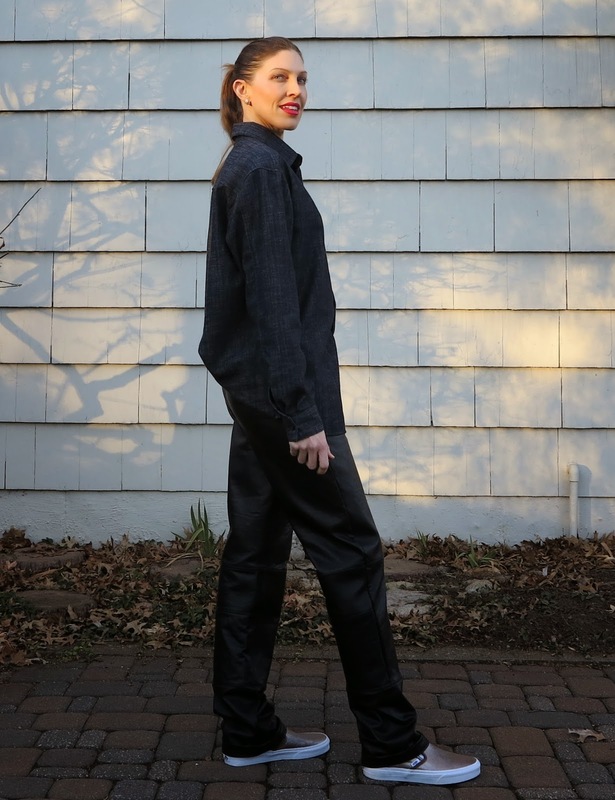 Since my complete denim on denim outfit is still in the design stages, I had to content with my much loved leather trousers for these photos. 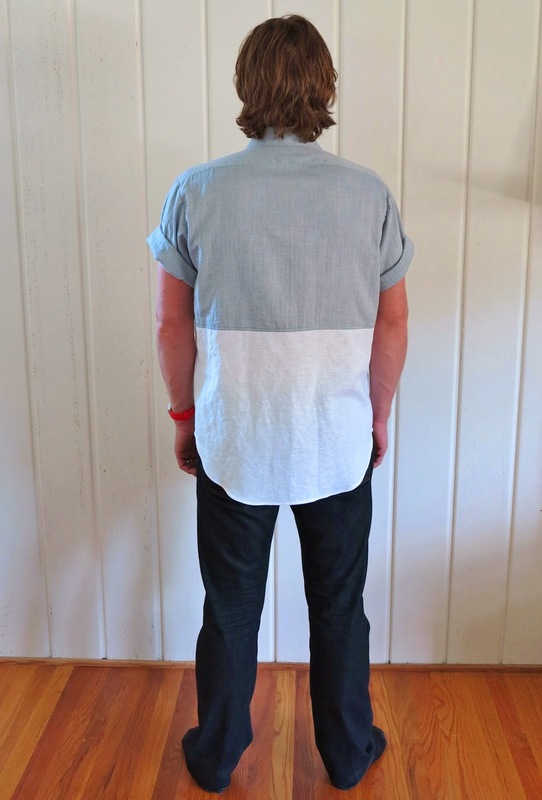 The fabric I used for this shirt is a very soft and lightweight denim. It is blue, but so very dark that it almost looks black. I was hoping for a paler denim colour when I purchased it online, but I’ve grown to love the darker hue. The pattern I used was McCalls 8082, with just one modification. 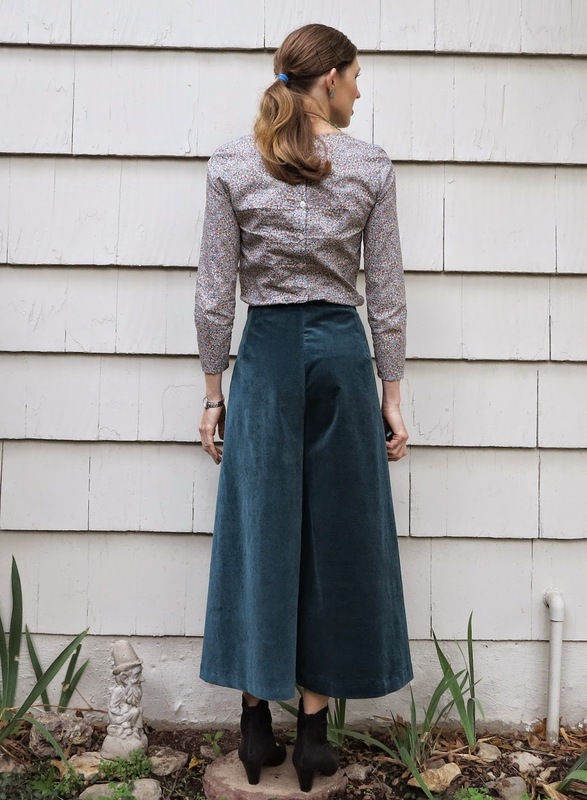 I took a small step away from the very 80’s look of this pattern by narrowing the top of the sleeves and raising the armscye each by just over an inch. This helps to slim down some of the excess fabric under the arm and through the bust for me. I love how this shirt turned out. Denim really does go with everything, so you’ll probably also see me pairing it with my maxi skirt when the weather warms. 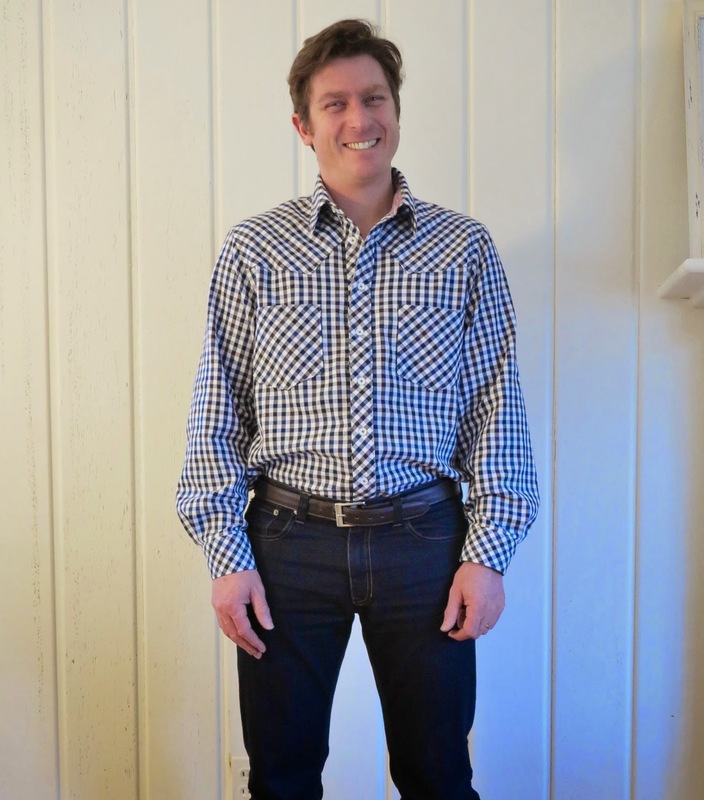 This entry was posted in denim, McCall's 8082, men's shirt, Mood, shirt on January 18, 2015 by Debbie Iles. So here is the original version of the shirt you saw in my last post. The birthday boy was extremely happy with his new shirt, and very amused with my copycat version. Catching him for a photograph is near impossible, but I promise to try and get a shot of us both together in out matching shirts at some point in the future. Although I suspect that photo is going to require a great deal of stealth on my part. Otherwise, there isn’t much more to say on this shirt. White collar, white cuffs and some nice clean stripes. You really don’t get much better than that for business attire. This pattern is a TNT for hubby with makes my life easy. If you are after some more details, be sure to check out my earlier makes (here and here). 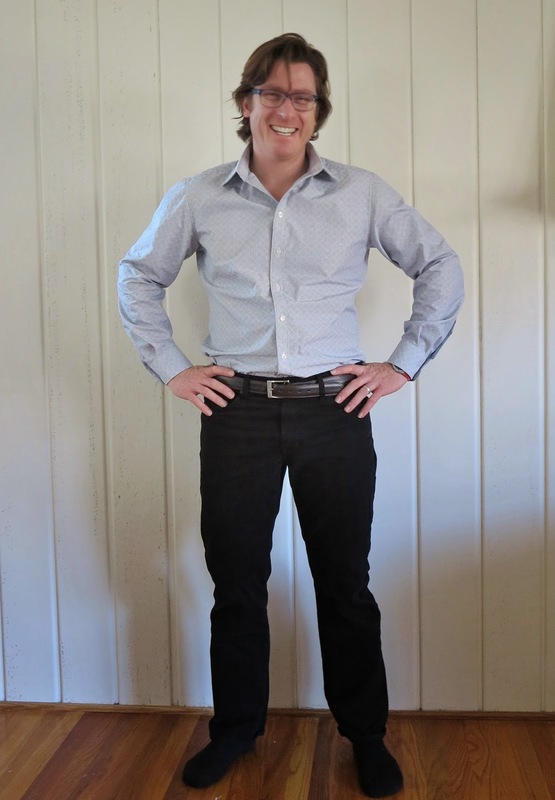 This entry was posted in cotton, men's shirt, Mood, shirt, shirting, Simplicity 6138 on December 13, 2014 by Debbie Iles. I’ve made this shirt so many times now that it’s getting ridiculous. 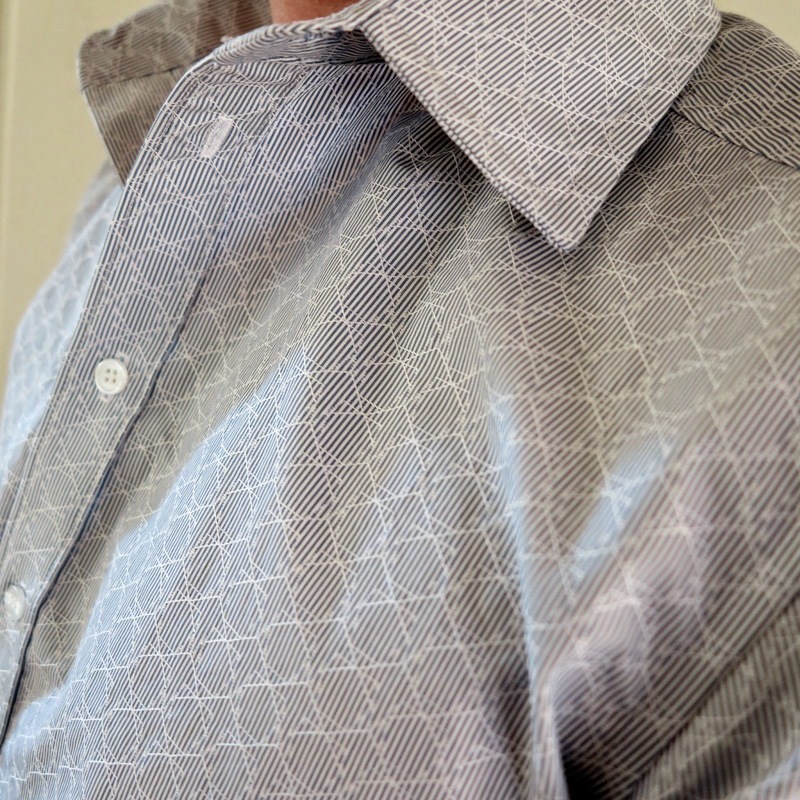 I love that I’ve got a TNT business shirt pattern for husband. It certainly makes birthdays and Christmas easy. The fit is very good on him, even if he looks quite rumpled and uncomfortable in the photos. I did try to straighten him up a bit, but I have to call it a plus if I can simply get him in front of the camera. Like in my last versions, my only modification was to add back darts. I still need to press them better, but somebody hastily donned his new shirt, literally before I could finish it. This was the fabric I’d originally chosen for his shirt, but it sold out in lightning speed. I might have been a day too late but my disappointment didn’t last long because because I discovered an equally gorgeous and unique shirt fabric that I think I like even more now. It’s call Blue Striped Unknown from Tessuti Fabrics. I’m wondering if I should get myself some more before it sells out. Or I could just steal the shirt for myself. 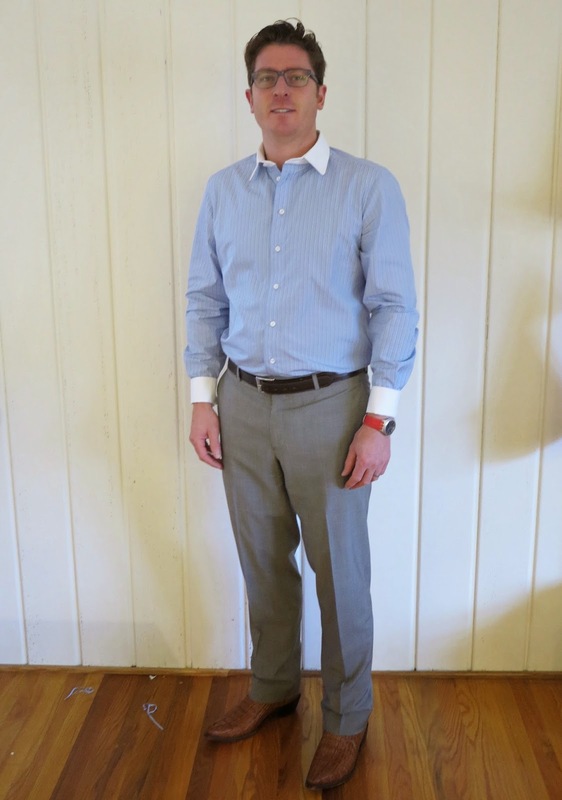 This entry was posted in cotton, men's shirt, shirt, shirting, Simplicity 6138, Tessuti Fabrics on November 29, 2014 by Debbie Iles. I’m pretty sure you’ve heard me say this before, but I don’t particularly love sewing men’s shirts. I think it’s the degree of perfection required with those collars and cuffs. It could also be because it’s selfless sewing and the kind of sewing that doesn’t really allow me to experiment much. I’m not allowed to deviate much from a standard pattern. Well, in hubby’s case I do. He’s a fan of classic. 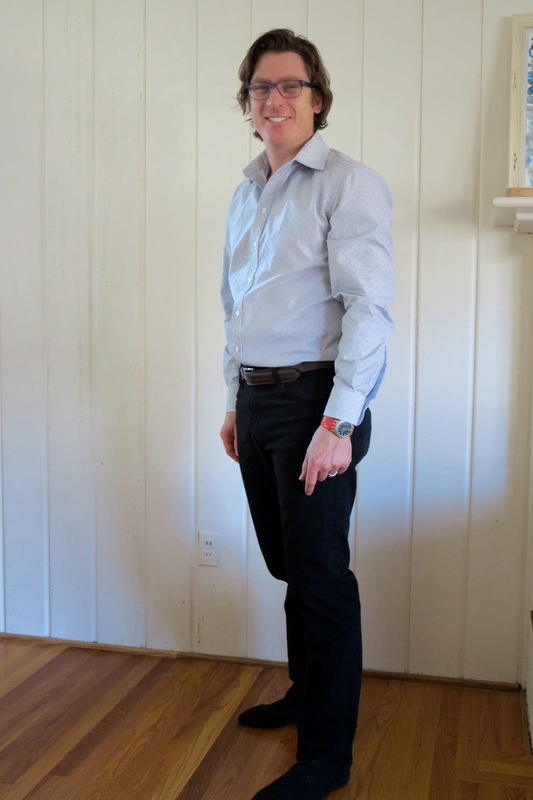 So after doing my nice-wifely duty of sewing him a proper business shirt for his birthday (that post will come later), I decided to experiment with a casual ,short sleeve shirt. I was inspired by a GANRYU COMME des GARCON shirt that I saw on Pinterest. My plan was to keep the pleats but colour block the bottom instead of the curved pocket details. I chose some Anna Sui chambray for the top and some white linen for the bottom. The patten I used was Kwik Sew 3883. I’ve sewn this pattern before (here and here). It’s taken me until now to finally admit that it isn’t a great fit. 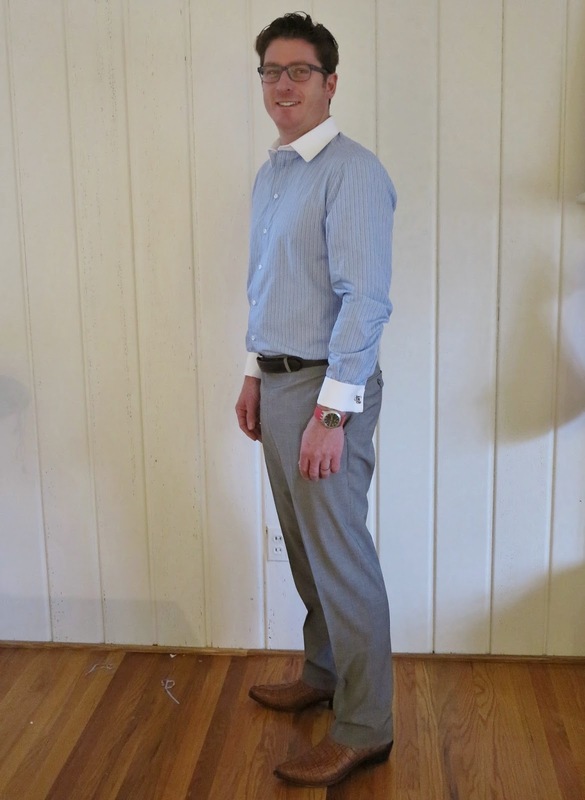 The shirt is just too wide in the torso, and perhaps a little wide on the shoulders too. The seam allowance of 6mm is also impractical. I usually start out sewing the shirt with the wrong seam allowance. But even when I get it right, 6mm is way to fiddly for nice felled seams. Overall, I don’t mind how this shirt turned out. 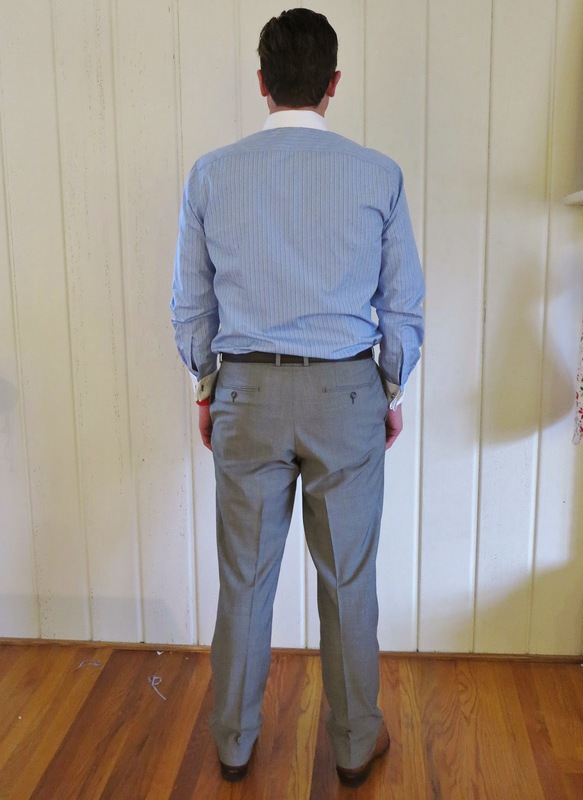 I wanted to bring the sides in by about an inch to slim down the fit for hubby, but he opted to forgo my alterations and send it to his Dad (who is a little bigger than him) instead. His initial reasoning was that it was a Summer shirt and we were headed into Winter. But I delved a little deeper and the truth came out. The fact of the matter is that the chambray reminds him of his old school uniform and the colour blocking makes him feel like Charlie Sheen in Two and a Half Men. I guess colour blocked shirts are off the cards for hubby in the future then. What do you think? 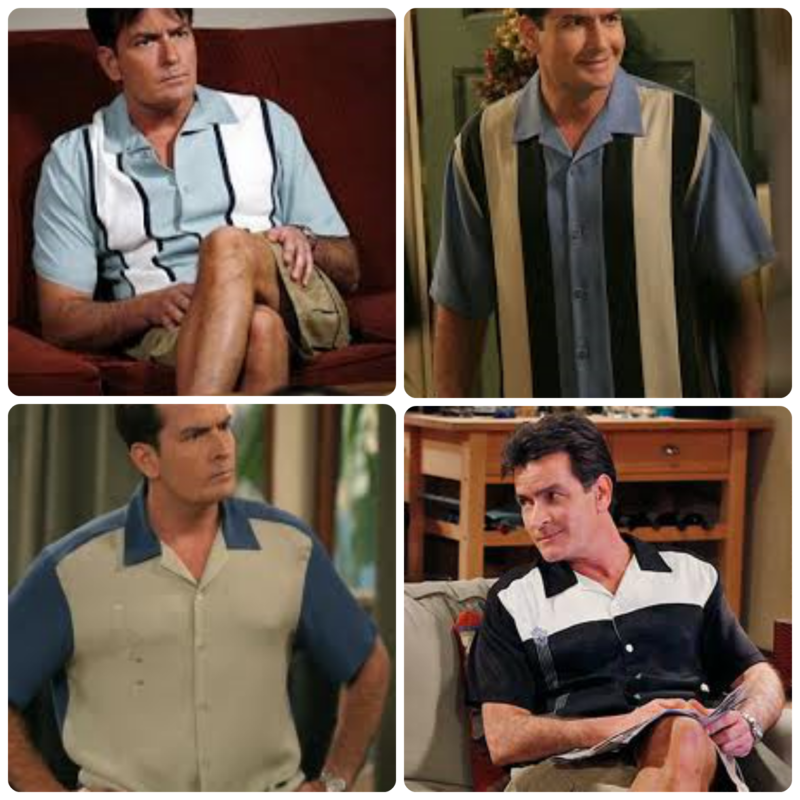 Have I made a Charlie Harper shirt? 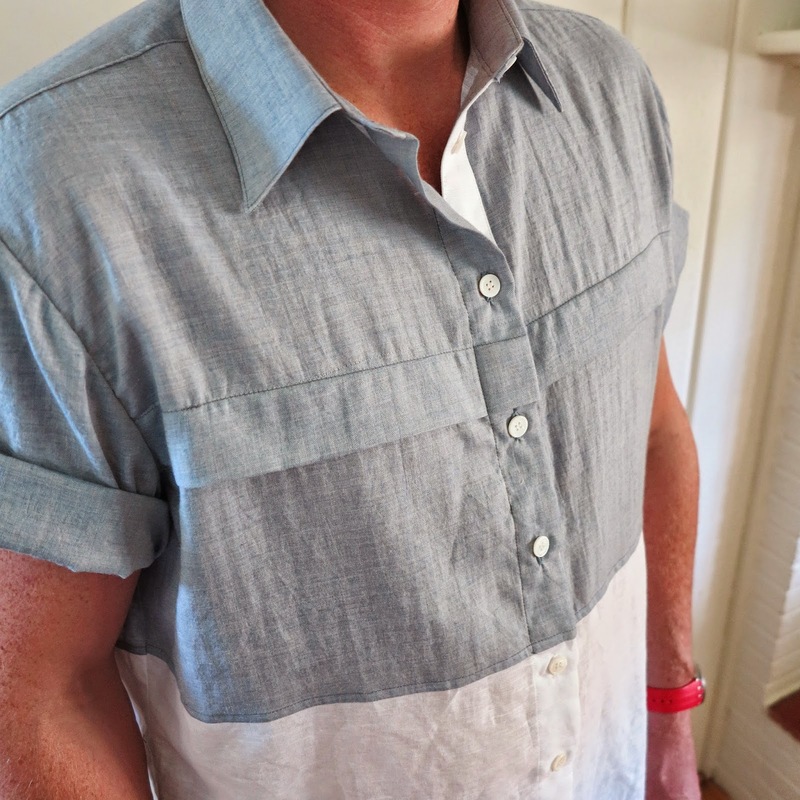 This entry was posted in chambray, cotton, Kwik sew 3883, linen, men's shirt, Mood, shirt, shirting on October 11, 2014 by Debbie Iles.